Every state in the U.S. has provisions for the notary public position in order to maintain a regulated and clear distinction of their specific laws and guidelines. It is important to understand what these rules are as a notary public so that you can stay in compliance and avoid having the authority removed and charges possibly filed. Some of the basic similarities between states is that a notary may only perform their function within the boundaries of their commissioning state regardless of where the documents originated from. They cannot notarize their own signature and must follow guidelines when notarizing signatures for family members. The Kansas notary public position is one that carries authority and should engender respect from those who needs that service. 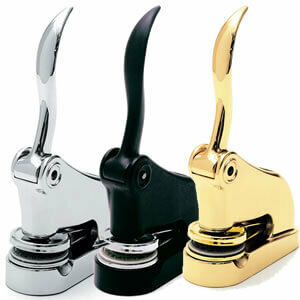 The stamp and seal are part of the tools of the trade and when purchased from a reliable vendor then they should leave an image that is clear and professional looking which is exactly what this position deserves. In order to be a Kansas notary public, the individual must complete the necessary application, pay the admin fees and have the proper insurance coverage for protection. The final piece is obtaining and using the tools necessary to imprint the regulated image on the paperwork and documents. Kansas has lenient rules regarding their notary public stamp and seal which makes it simple to order with online vendors. Regardless of which vendor you use, it is still your responsibility as a notary public to ensure that any products you utilize are good quality and in accordance with state laws. 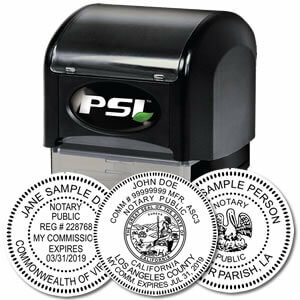 This state requires the use of either an ink stamp or embossing seal. The notary's image must be photographically reproducible so if a seal is used, a seal inker should be used in compliance. This ensures that if the paperwork is copied that all necessary images are carried over. 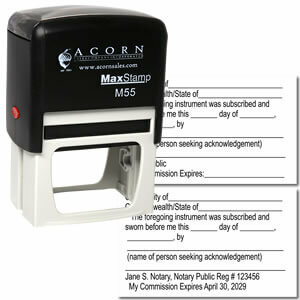 The impression must have the notary’s name, “Notary Public” and “State of Kansas” as mandatory items with “My appointment expires _____” as an option. There are no size or shape requirements allowing the individual to choose their final image according to preference. One of the best steps for you to make in the ordering process is to ask for a proof image in order to validate before it goes to production. Don't Forget Your Record Book! The fact that you are able to order your supplies online makes it easy and convenient to get everything you need from a single source. Most vendors also offer kits and packages so that you can get all the supplies together which usually saves you even more money. The notary public record book is an important accessory to have because it allows the individual to document all the transactions and required information in an organized manner in case of an audit. Have An Embosser? Don't Forget Your Seal Inker!